But he’s also managed to pull them in right at the end of the book. Isaac just has to keep Henry busy until the bells ring signalling the end of the book. He then runs before the ogre attacks and prepares to eat Henry – before being stopped by the good and noble… Rumplestiltskin. Henry is duly rescued – and he has a copy of Isaac’s book in his pocket to guide him as to what’s happening next. He follows the book direction past several traps to find Regina, the archer, and introduce himself. She’s not exactly convinced but she does believe that he believes (which means she thinks he’s delusional). But he has the book – but annoyed and upset that the book knows her future, Regina burns it; Henry only manages to save a page. So Henry is left to wing it – which basically means convincing Regina to find Robin and have true love’s kiss. Cynical archer Regina is not sold on this plan since she hates Robin, her main competitor. She’s more interested in fleeing the kingdom to escape a queen who hates her for ruining her life – which she did (sounds like she’s stepped into Snow White’s shoes before they became so soggy). Isaac, the inept author who doesn’t remember his own book ends up falling into the hands of the seven evil dwarfs who take him to be a Regina supporter and a traitor. To the palace and Evil Queen Snow White who looks considerably less soggy (but probably a lot less evil since this version may not want to sacrifice small children). She doesn’t rock the wardrobe nearly as well as Regina did. Regina ends up ambushed and making excuses for killing James while she was a child (so even their ages have been flipped in this retelling with James taking the place of Daniel). Before Snow can burn Regina (of course Snow has magic) Robin rescues her. Much snark follows between the adversaries who never met before. He wants to step down as head of the Merry Men because he’s madly in love with Zelena, his fiancée. Regina is, of course, bitter and sad. Henry catches up to tell Regina that Zelena and she have also swapped places (Regina is now the one abandoned as a baby). In between realising that the ending for the book is Zelena and Robin’s marriage, he also learns what happened to Emma, the Saviour – she’s been locked up years ago by Snow White (again with people not stabbing their enemies in the head). Henry’s next move is to recruit Captain Hook – except Killian is just a deckhand in service to Captain Blackbeard. With Killian far too afraid to confront the captain, Henry knocks him out with convenient rigging so they can steal the ship. Henry finds Emma – and she recognises him. Part of her horrible non-happy ending is for her to know how bad everything is, how wrong it is, but be powerless to stop it – a really powerful and meaningful punishment for the Saviour whose whole life and role is about making things better. Of course Killian doesn’t remember her even if she remembers him (and makes him very uncomfortable). Next problem – her guard was Lily, and she chases them in dragon form. Thankfully cannon beats dragon. (And Killian is allergic to rum… oh the pain that’s just cruel Rumple). While, back in the castle, Evil Snow kills a dwarf for failing, Emma teaches Killian how to fight, in a nicely gender-reversed guy-teaches-a-woman-how-to-do-x-with-lots-of-body-contact move. Uncertain Killian is surprisingly cute. Evil Snow and her minions show up and Emma tries to appeal to her parents with the truth. Amazingly that doesn’t work. Killian offers to basically sacrifice himself while Emma runs to save Henry, which she does. But Killian beats David – he may be a coward but apparently this Killian still has real Killian’s muscle memory (which, I suppose, means he’s better with a sword than David). Unfortunately he postures way too much at Evil Snow (who doesn’t fry him for… reasons) and get stabbed by David. To the Wedding – but Rumple the Light One is in the way – and dropping “dearies”. Emma fights him while Regina runs to the wedding ceremony. Until Rumple resorts to magic and knows Emma out, leaving Henry to grab the sword. Thanks to the hero, Regina’s, sacrifice Isaac’s villainous work was undone. To Storybrooke and lots of loving joyful reunions. Sappy awwwws all round. Henry looks over his books when the Apprentice appears to explain why he can’t bring his dad back from the dead and all about writing the Truth and resisting temptation. Henry snaps the quill – no-one should have that much power. The Apprentice is impressed. In the pawn shop, Rumple is turning dark even as Belle protests he already HAD everything he wanted from the book: her love and happiness. But Rumple never believed it, he didn’t believe Belle could truly love the Dark One. He tells her to go with Will, but she doesn’t, she doesn’t love him. She wants to stay with him as he dies though he tells her to run – for soon only the Dark One will remain. Why is “stab him in the head until he stops twitching?” never a solution in these stories? And don’t claim moral outrage of the good guys, it will just make me bring up the baby sacrificing Charmings again and point out that locking someone up in a magical page for all eternity is hardly more merciful than a bit of head stabbing. I don’t like how this episode worked with what was established before. The whole point of “villains get happy endings” was just that – villains got happy endings. Not that they became heroes and then got happy endings. That was, at least inferred, always on the cards – the villains could find their happy endings anyway so long as they actually turned away from villainy and pursued their happiness through good. This was constantly hinted at over and over as the true path to happiness in this world. I don’t like this because it also connects to the broken morality of this show in that heroes seem to be inherently heroic rather than heroic because of deeds and behaviour. His book would be broken by any hero getting their happy ending – but that only works if you classify Mary Margaret as a her EVEN WHEN she’s the Evil Queen or Rumplestiltskin as a villain EVEN WHEN he’s a noble ogre-slaying knight. Ok we can argue that any hero in the book is a false hero because it’s just how the Author has written them – but isn’t that what the Author does? And it shakily adds to this season’s already shaky morality already established with Snow White and David doing what they did to Maleficent’s baby and the broken way everyone reacted to it. Again, there’s a sense that heroism is something inherently held by some people even when their deeds are pretty villainous which the Author’s world reinforces. And we have to add to that broken morality- Rumple now has a glowing white heart because woo-woo. The dark heart has always been a sign of moral degradation on this show (though it doesn’t apply to baby stealing) – so, what, he’s magically absolved? No longer responsible? Forgiven? Purified? But I did love the ending. I loved that it was Regina’s sacrifice for her son (upholding her motherhood) and not love of Robin (because, as she’s said before, while her happy ending INCLUDES Robin, it isn’t BECAUSE of Robin which is a wonderful and important distinction). I love that Henry is the author, because this is how the story began with Henry and his stories. This was always the core and the beginning of the whole season. It’s perfect. Other decent things – Belle, I hate her choices and wanting Rumple, but I do like that she does reject Rumple handing her over to Will. Her wanting Rumple may be broken but it IS what she wants and what she chooses not what he decides is best for her. Maleficent was toweringly awesome and I really hope we’ll be seeing more of her. I also liked both Cruella (time we got some non-angsty villainy here!) and Ursula had a decent, but limited, back story I appreciated. What I don’t appreciate is the diversity of this show. Regina is the only recurring POC of any real prominence out of a REALLY vast cast. 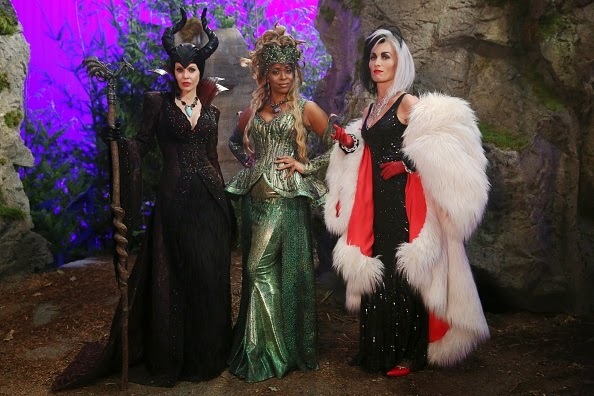 We had Ursula, but her power, presence and general impact on the story was the least of the four villains and while I really liked how her story ended, it also took her out of the main plot before she really got involved in it. She was a good character, but used too little. We had Marian… but even that turned out not to be the case because she was not only killed off, but retroactively killed off so she never, truly, existed. She didn’t just die, she was erased. There were no LGBT characters, again, and the still-not-entirely-clarified-Mulan, despite being one of the Merry Men, has fallen into the plot hole never again to return, it seems. With these limited or non-existent inclusions we really have to remember how VAST the cast is. Look at the Frozen cast, look at Emma, the Charmings, Lilly, the four villains, Regina, Isaac, the Apprentice, Zelena, Rumple, Belle, Killian, Henry – and these are just major, prominent characters not including the Blue Fairy, the dwarfs, Granny, the Merry Men, Roland, August…. Per IMBD this show has had 55 characters who have appeared in 6 episodes or more and a vanishingly small number of them are POC and only 1 has been hinted at as possibly-bisexual-but-maybe-not. That’s an appalling lack of even tokens, let alone sizeable inclusion. As the series continues (it has been renewed) and the cast grows, this is a problem that will only get more glaring.